Do you know that you can prepare yaki udon (焼きうどん) in just twenty minutes? 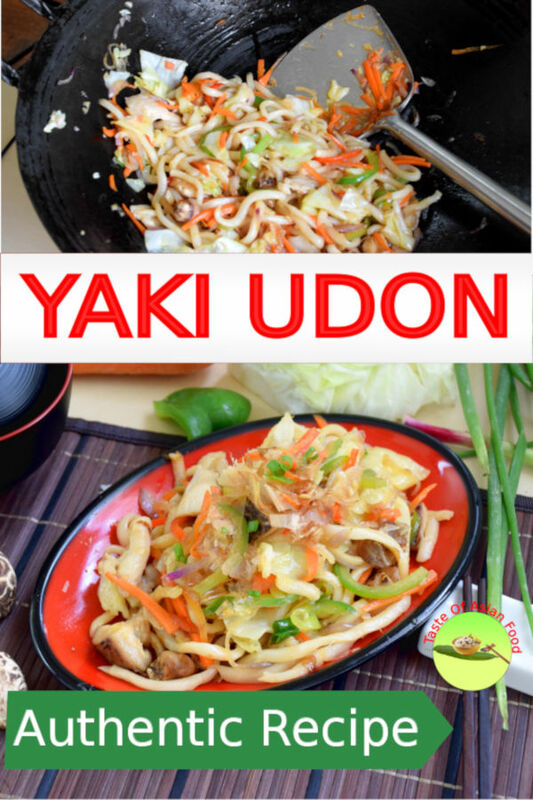 Here is the yaki udon recipe for you. 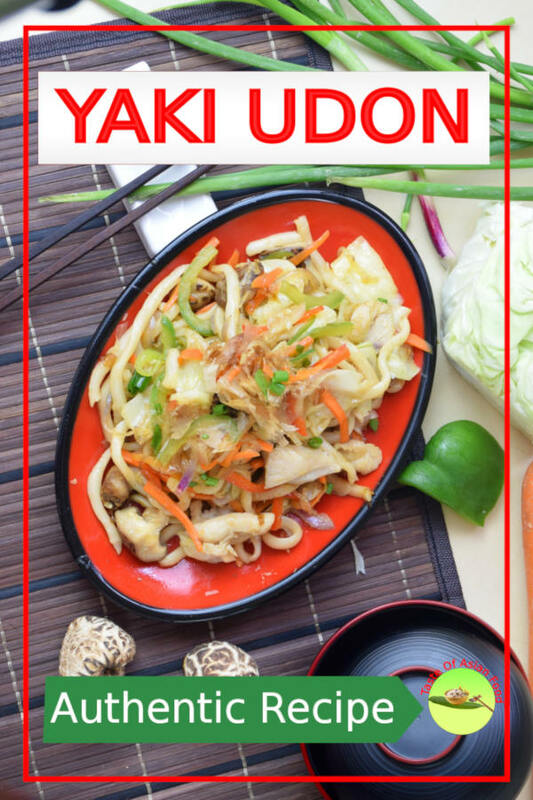 This article will show you how to cook yaki udon, the Japanese fried noodles with a few simple ingredients available in your refrigerator. You are good to go as long as you have a packet of udon on hand, plus some Japanese soy sauce and mirin. Take a look at this colorful and appealing yaki udon. 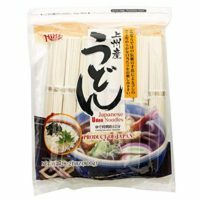 What are udon noodles? Udon is a type of thick, white, slippery-smooth, and chewy noodles made with wheat flour. Udon is served primarily as a soup noodle but is perfect for this udon stir-fry recipe, as it soaks up all the flavor during stir-frying. The result in a wholly comforting, delicious and satisfying quick meal. The preparation is similar to any Chinese fried noodles. So next time when you are planning for a quick lunch or a weekday dinner, make use of the leftover in your refrigerator. That is why it is more of a home-cook food than a restaurant dish. Although this is an easy yaki udon recipe, there are a few tips I want to share with you before you begin. Here is a list of tips you need to know before heading to the kitchen. I hope you will enjoy this slippery, toothsome noodle dish 🙂 . Fresh udon is the best. However, it is hard to get unless you know some kind-hearted Japanese chef who is willing to share some with you. It is likely that you will get the frozen one, which is relatively ubiquitous in the Asian grocery shops. If you use the frozen udon, boil them until loosen. Do not overcook the udon as the noodles will turn mushy. Drop the noodles into the water and sample them often and cook until the firmness and suppleness your prefer. Drain well and set aside. I can get refrigerated udon easily in most of the supermarket in Kuala Lumpur, as there is a sizeable Japanese community over here. I suggest you ask the shop owner if the stock this type of udon as this is the best one after the freshly made udon. Since it is not frozen, it can be used directly out of the packet. If the noodles stick together like a cake, loosen them under running water. I use the refrigerated Sanuki Udon in this yaki udon recipe. Dried udon noodles are generally has a lower quality. It is thinner and shorter, less chewy, easy to break and won’t absorb the gravy as much as the wet type. There is no shame to go for the dried noodles, but if you have the choice, go for the fresh one. You are free to use any vegetables in the yaki udon recipe. In fact, it is a great way to make use of the leftover in the refrigerator. I use onion, carrot, cabbage, Shitake mushroom and capsicum in the yaki udon recipe. However, you can add any vegetables available in your refrigerator. That is why I mentioned earlier it is more of a home cook dish than a restaurant cuisines. Green bean, asparagus, French beans, and broccoli also produce a reasonably satisfactory result. Pork is the choice for most of the people, especially pork belly slices with some fats in between the lean meat. You can also use lean pork for a healthier meal. You can also prepare chicken or beef yaki udon. Use some firm tofu as the source of protein to prepare the vegetarian yaki udon. Other favorite inclusions are shrimps and squid. Fish meat is not a good choice as it can turn mushy and breaks while flipping and stirring in the wok. 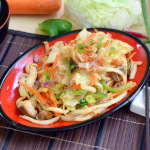 Use the Japanese soy sauce for yaki udon to get the authentic flavor. It is similar to the Chinese light sauce but has a distinct flavor. Indonesian soy sauce tastes totally different from Japanese soy sauce and should never be used in this yaki udon recipe. It is suitable for dishes like making satay, stew beef in sweet soy sauce and other more specific Indonesian and Malay dishes. 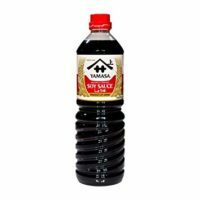 Chinese dark soy sauce has a caramelize flavor which is good for stir-frying Chinese style noodles and as the component of other Chinese dishes, such as General Tso’s chicken. Vietnamese fish sauce looks similar to soy sauce but is made with fermented fish instead of soy. It is best for making the dipping sauce for spring rolls and other Indochina dishes such as Thai basil chicken. 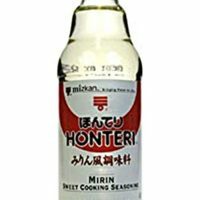 Another essential ingredient is mirin, the Japanese sweet cooking wine. It has a robust umani flavor that enhances the flavor of any food you cook. You can simplify the list of ingredients it by getting a bottle of Mentsuyu. Its major components comprise of Japanese soy sauce, mirin, dashi. The original purpose is supposed to use it as a soup base by diluting it with water. However, you can use it as the short cut by using it instead of getting the soy sauce, mirin, sake, and dashi separately. This is convenient for occasional Japanese cooking, but you will lose the flexibility to adjust the amount required of its respective components. 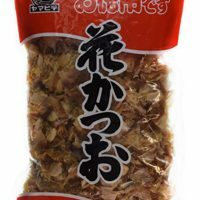 There are two types of Mentsuyu in the market, the regular strength and the concentrated type (generally written as 3x concentration). Adjust the quantity required accordingly. Other secondary ingredients are Worcestershire sauce and oyster sauce. Both sauces are not the authentic Japanese ingredients but are a welcome twist to the traditional flavor. Stir-frying with high heat generates the aroma that you are familiar with at the Asian restaurants. However, it does not mean that high heat is required throughout the stir-frying process. The general rule is to start with sauteing the garlic over low heat. You can stir-fry the meat separately from the garlic to avoid the garlic get burned when the meat is cooked. If you are vegetarian, skip the meat and add some tofu at the later stage of stir-frying. Saute the onion over medium heat until it turns soft. Add vegetables such as carrot slices and cabbage. When the cabbage starts to wilt, add the udon and the mushrooms. If you use high temperature at this stage, the udon will tend to stick to the wok. There is a workaround way to avoid sticking – use a nonstick pan. 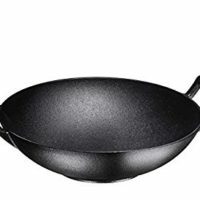 However, the result is never as good as using a cast iron wok or stir-fry on the teppan (iron griddle) as both can withstand high heat. Turn to high heat only after adding the seasonings. Since most of the seasonings are sauces and wines, they moisten the udon and prevents the noodles from sticking to the wok. Stir fry over high heat with a quick motion to avoid sticking. High temperature generates the unmistakably familiar wok aroma from the restaurant which beckons the customer from far. 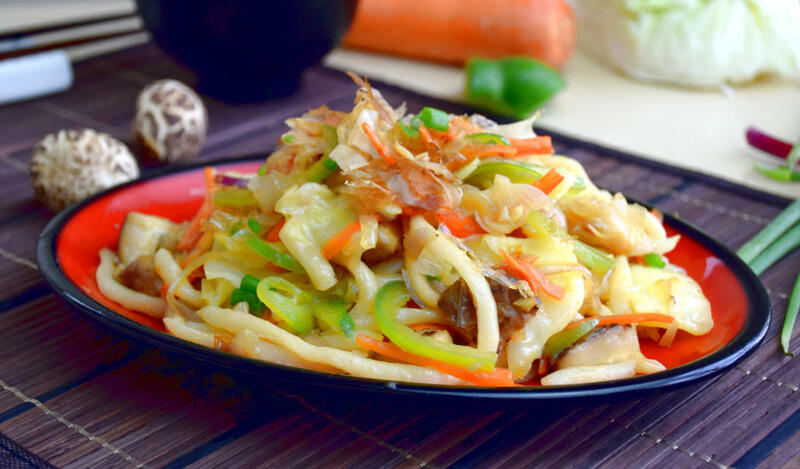 It is now your turn to try out this simple yaki udon recipe. Japanese foods are not difficult to prepare and healthier than many other cuisines. Perhaps that is why the Japanese have the longest life expectancy in the world. If this is due to the food they eat than let’s cook Japanese food. There are a few Japanese recipes I posted previously- Karaage, Chawanmushi, Miso soup, Japanese cheesecake, Japanese milk bread, and chicken katsu. Do check them out and hope you will like it. This video will show you how to prepare the Malaysian style Tomato Rice. (6.33 minutes). It is located below the Instruction, above the nutrition value in the recipe below. Yaki udon is the Japanese version of the stir-fried noodles, using the udon noodles with a unique flavor Japanese flavor. This is the yaki udon recipe with simples ingredients with some Japanese seasoning. Cut the meat to bite size, preferably into thin slices. Mix with 1/2 tsp of salt. Marinate for 30 minutes. Soak the dry Shiitake mushrooms until fully hydrated. Cut the capsicum into strips, mushrooms into quarters, carrot into matchsticks, onion into thin slices and cabbage into roughly into one-inch square pieces. Mix all the ingredients in (B). Set aside. Heat the vegetable oil in the wok, saute the garlic over low heat. Put the chicken slices and stir fry until it cooks. Dish out. Add the onion and use medium heat to saute until it turns aromatic and soft. Add the cabbage and carrots. Continue stir-frying until the cabbage starts to wilt. Put back the chicken into the wok. Add the mushrooms and udon. Loosen the noodles and mix well with the vegetables. Add the seasoning B. Add the capsicum. Mix well. Stir fry over high heat to generate the wok aroma for a short while, about half a minute. Add some ground black pepper and sesame oil, mix and dish out. Garnish with chopped scallions and topped with katsuobushi. 1 Response to "Yaki Udon recipe – How to cook (with five important tips)"